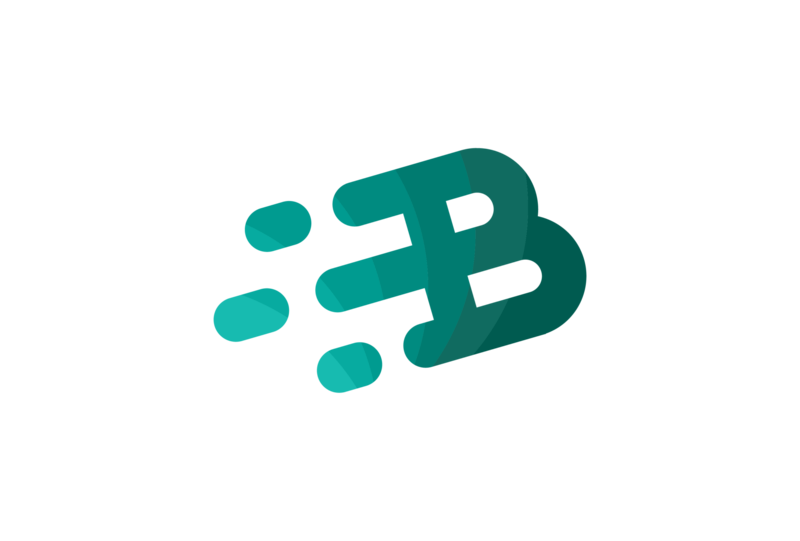 Don’t you think a website with a custom URL looks more legitimate than one with a URL like http://mywebsite.blogger.com? Using a custom URL for your blog not only makes you look more professional, it’s also easier for people to remember. Buying a custom URL can be an intimidating task for many, but it’s really not that difficult! In this article I’ll help you find the the best deal on a custom URL for your blog. Still need to come up with a URL for your blog? Don’t worry – we’ve got you covered. Check out our article “How Do I Choose a URL For My Blog?” by clicking the link below. Article: How Do I Choose a Blog URL? There are a couple of ways to get a URL for your blog on the cheap. One way is to buy web hosting with a coupon that includes a free domain name. The other is to buy only the domain name with a coupon. Let’s look at each way. There a bunch of places to get a domain name free with web hosting. If you need to buy web hosting, check out the article I wrote detailing what makes a good web host. For now, I can only recommend one to my clients, friends, and family. I recommend Dreamhost to everyone. I’ve been using them since 2006 and they’ve gone from great to even greater. If you use my affiliate link you’ll save $50/year and be eligible to get a free domain name when you sign up for web hosting. Your blog will cost about 10 Starbucks lattes per year, and I’ll earn some money to keep this blog running. If you don’t want to save money, I’ve also included a non-affiliate link below. There are so many places online to buy a URL from your blog but there’s only one that I can recommend if you’re on a budget. 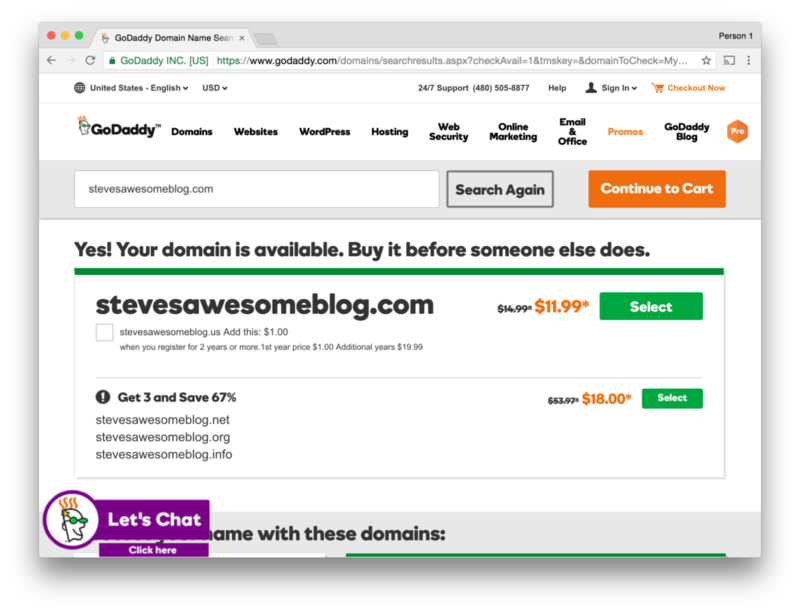 GoDaddy is a domain registrar that almost always has promo codes that make buying a URL dirt cheap. Godaddy also offer web hosting and custom email, but I prefer using Dreamhost for that. Only one person at a time can own a custom URL, so we need to make sure the URL you chose is available. 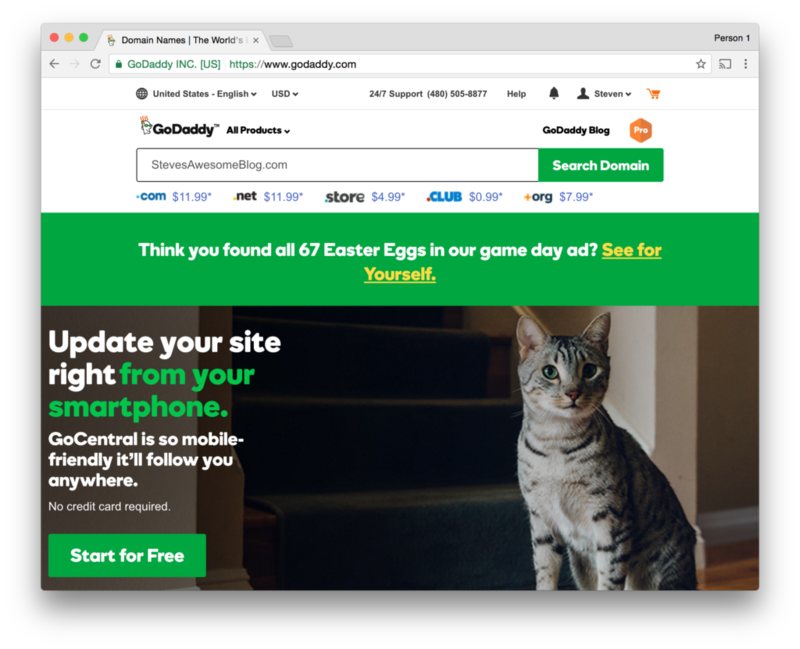 We’ll check the availability of the URL at GoDaddy.com because it’s really simple. You might need to search for a domain name a couple of times since many are already taken. Don’t give up, and if you run out of ideas, remember my advice for choosing a blog URL. 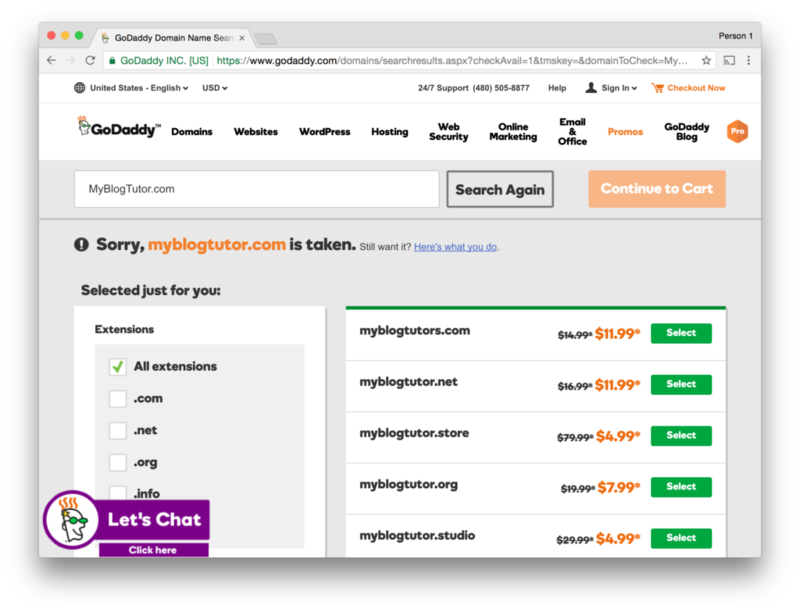 After you find a domain name that’s available, you should buy it…with a discount! Use my Dreamhost affiliate link if you still need web hosting and you’ll get a $50 discount and free domain name. 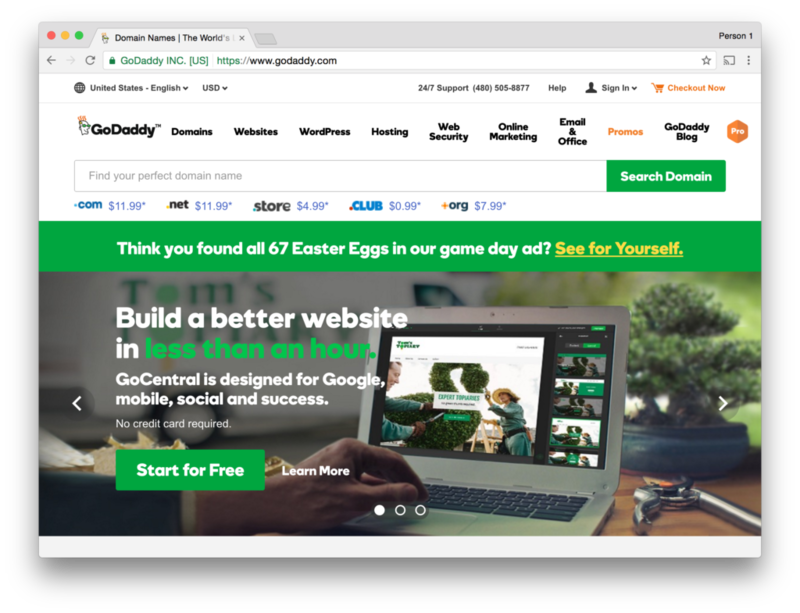 If you already have web hosting and need to buy a domain from GoDaddy, you could use Google to find a coupon code, or you could save a bunch of time and install the Honey browser extension and let them do it for you. Long story short, Honey tries a bunch of different coupon codes on any checkout page (GoDaddy, Amazon, you name it) and they apply the one that saves the most money. It’s totally free and it’s saved me hundreds of dollars this year, so you should definitely check it out. Hopefully now that you’ve got a custom URL, your blog will seem more legitimate in your eyes; it definitely will in everyone else’s. I remember when I started my first GeoCities website (I’m dating myself now…) it never felt official until I had my own custom URL. Back then I thought it was difficult, and based on questions I get I know people still think it’s difficult, but as you saw it’s not. If you have a blog, make sure it has a custom URL. Follow the steps I outlined in this blog post and when you buy one let me know what your new URL is! How Do You Choose a Good Blog Topic?